QuoteURLText is a Firefox Extension for copying text into a format for pasting. COMING SOON! 1.09 with support for Firefox 3.5! The update has been sent to Firefox review. Expect an update soon! To install the plugin, download the xpi from the link above, then use "File > Open" from Firefox to open the file. Firefox will then install the plugin. Quote URL text will copy selected to the clipboard including metadata about the page (Page Title, Location and date of copy). It provides options for plaintext or rich text copies. 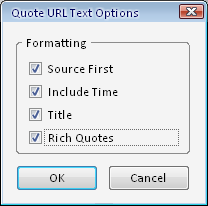 Advance formating (available from Tools -> QuoteUrlText) allow users to format the order of the URL, Title, Date and Quote as they need. Quoteurltext was a featured Firefox Extension on Lifehacker! Copyright © 2009 Vijaykumar Palat. All rights reserved. Design by NodeThirtyThree Design.